The field proven Rugged Systems� UPS line is ideally suited for commercial, industrial, computer and telecommunications applications requiring high reliability, rugged construction, compact size and light weight design. These units are equally suited for use in shipboard, airborne, vehicular, field deployed or fixed locations with controlled or uncontrolled environments. The ETI0001-1473AF was specifically designed to meet the stringent requirements of FAA programs including WAAS. The ETI0001-1473AF does not require a separate PDU since the PDU functions are already integrated into the UPS module. 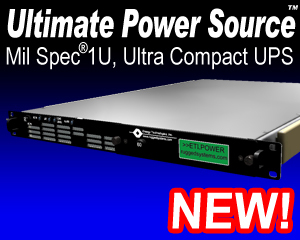 This saves rack space, cabling and expense while improving overall reliability. The heavy-duty chassis, occupying only 5.25� (3U) for the electronics and 3.5" (2U) for the optional battery module by 22� depth, delivers up to 2000 VA of clean, uninterruptible power. The rounded metal corners and rugged handles, both front and rear, aid in safe handling. Internally, all major components are well secured and electrically insulated to prevent damage due to shock and vibration in any axis. The unit also operates as a frequency converter, taking 46-70 hertz input and converting it to 60 or 50 hertz power switch selectable. The unit can also be ordered with 46-440 hertz input. Special EMI/RFI filters and input power factor correction minimize both input current and harmonics. The ETI0001-1473AF has the added benefit of having an internally redundant 24 VDC DC power source output. The Status connector provides an interface with optional computer software providing loss of AC and low battery status as well as remote shut down capability. The UPS Remote Control and PDU Remote Control connectors provide an interface to optional remote display/control panels. The RJ45 LAN port provides an SNMP/HTTP interface for various UPS parameters and control of the load outputs. Internal software functions include the ability to Sequence Loads of Startup and to Shed Loads for either Overload, or Over temperature or to lengthen battery run time (when used with battery modules). These functions follow a user defined priority lists and schedules. Overall, the Rugged Systems line is uniquely qualified for critical systems combining advanced modular design features with highly reliable construction.